At a press conference Saturday aboard the new Carnival Breeze, Carnival Cruise Lines’ President and CEO Gerry Cahill talked about the company’s emphasis on the outer areas of the ship. He said that Carnival passengers have indicated that they want to feel the essence of the sunny climates where Carnival ships sail — and not be clammed up indoors. What about you avid cruisers? 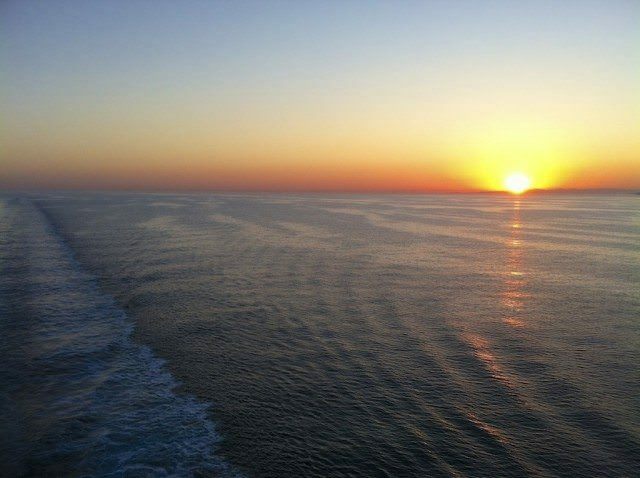 What is your favorite place to be while at sea? Clearly, being on the water is a magical experience for any cruise passenger. The sea, sun and the warm wind possess powers that are both restorative and rejuvenating. 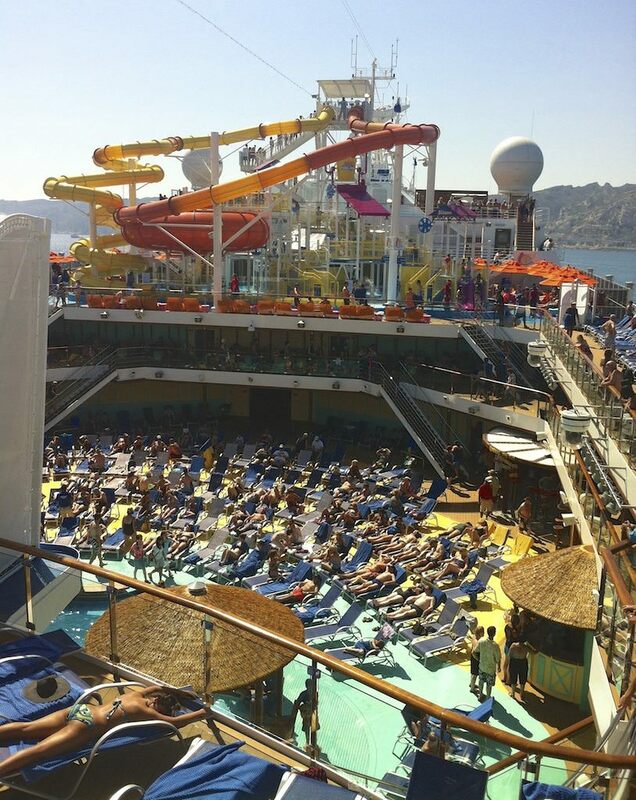 Today on Carnival Breeze, the outdoor decks were buzzing. Kids were enjoying the ropes course, foosball, basketball and two-level miniature golf at SportsSquare while others slipped down the giant Twister and Drainpipe slides. I enjoyed watching the PowerDrencher, a huge bucket that slowly filled, then tumbled to one side, dumping water on screaming kids underneath. Adults were mostly lounging in the sun. It was not easy to find an open deck chair, but I managed to do so after about five minutes of searching. Crowded, yes, but I sort of enjoyed the activity. When I needed to retreat, I put on my headphones and closed my eyes, enjoying the feel of the sun on my face. In designing Carnival Breeze, Cahill says the company notched up its emphasis on areas exposed to the elements, particularly on the lower exterior decks. One example where this is apparent is Ocean Plaza, which has the Plaza Bar, The Taste Bar and Plaza Café on deck five. The latter serves speciality coffees and teas as well as pastries and other confections. Ocean Plaza has more outdoor seating than on Carnival Magic, which had hot tubs where additional seating is now on Breeze. “We were trying to make it an indoor/outdoor space,” Cahill told a room of international journalists. I sat outside Ocean Plaza this morning sipping a Cafe Latté with Marseille as the backdrop. Adjacent to Ocean Plaza’s outdoor seating is a new dining outdoor venue called Fat Jimmy’s C-Side BBQ. Open only on sea days and only for lunch, the complimentary barbecue restaurant also serves a second purpose that is increasingly important to Carnival, and that is to disperse passengers so that the 3,690-passenger feels less crowded than it might feel otherwise. Carnival is looking to ease crowding in the Lido Marketplace, particularly during breakfast and lunch on sea days. The new outdoor venues on deck five are working well so far to break up the crowds. In fact, they may be working better than anticipated. On one sea day during the last cruise, management was expecting 750 guests to dine a Fat Jimmy’s. Nearly 1,000 showed up during the lunch hours. Likewise, a new Punchliner Comedy Brunch, served in the main dining room from 9 a.m. until 1 p.m. on sea days and also free of charge, attracts as many as 1,000 guests who come to dine and see the comedy performances. So theoretically, with 2,000 people dining in the new venues, the Lido Marketplace should be only half as crowded as it would be if it were not for these new choices. It’s buzz, not brand that Carrie Finley-Bajak serves up on her Cruise Buzz blog. Check out the latest in the cruise industry’s social media circles at the links below, and be sure to follow — and engage with — @cruisebuzz and @avidcruiser. That’s it for now. Follow our continuing coverage of Carnival Breeze this week on Avid Cruiser. You can also engage with us and buzz if you wish on Avid Cruiser’s Facebook page. Ralph, have you heard about the Colorline Cruises that sails in the area of Norway and Denmark? I’ve never cruised them, but my understanding is they are a cross between a ferry and cruise ship.